Sporty looks and amiable manners at a reasonable price. Wanna fit in at the burger barn but don’t have the bank account to support the high cost of a pure supersport? Are you interested in a comfortable ride on the street as well? You just might be interested in the retooled and freshly faired version of the existing FZ6 – the all-new Yamaha FZ6R. Emerging as an all-new model for Yamaha, the FZ6R bursts onto the scene in four vivid colors and graphics packages. Here you see the yellow stunter edition. Rumor has it the yellow bikes have more horsepower. 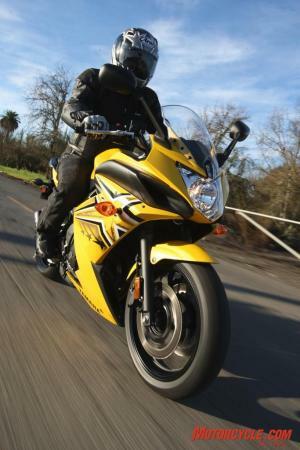 Yamaha has just introduced comfort to the commuting sportbike crowd. We’ve seen a lot of price-driven bikes crop up lately - cheaper bikes for a softer market - and Yamaha steps up the plate with a great looking player. While the sportier FZ6 is still available for the pure more experienced riders with a starting MSRP just $300 higher, the FZ6R dips below the $7000 mark and comes with a new steel chassis and a completely revised and retuned 600cc inline 4-cylinder DOHC powerplant that’s is sure to please many newcomers. New riders can expect to find an all-new steel frame and swingarm with comfortable and adjustable rider positioning to provide a bike that you won’t soon outgrow. The 30.9-inch saddle seat height (FZ6 is 31.3) can be raised 20mm from the stock position, while the bars can also move 20mm forward by rotating the bar mount columns with the included tool kit. Compared to the FZ6 model, the handlebar is 12mm rearward and 12mm lower. The seat position is 4mm forward and 2mm lower than the FZ6. The relaxed geometry, tighter rider triangle, tuned-for-low-to-mid powerband and R-bike styling make the FZ6R a notable addition to Yamaha’s sportbike line-up. Yamaha breaks down its “sportbike” category into three sub-classes: Supersport, Sport and Sport-Touring. Their research says 60% of its first-time buyers choose a Supersport bike like the R6 and R1, both of which aren’t exactly newbie friendly. 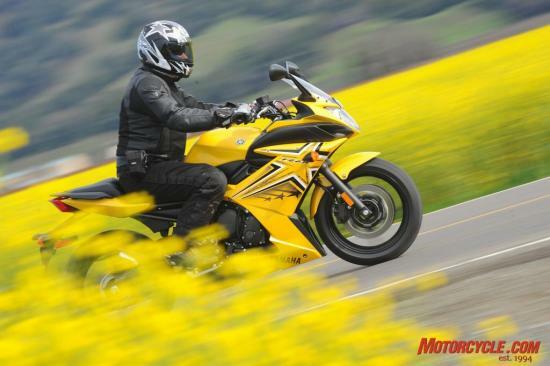 Just 32% of these consumers chose an FZ1 or FZ6 from the Sport category. But the Sport class has seen mild surges in sales for the past three years, surely due to more economically minded buyers in the market. They want sporty bikes as well as great fuel mileage and comfort. They also want to blend in with their friends’ sportbikes but don’t wanna be uncomfortable doing it. 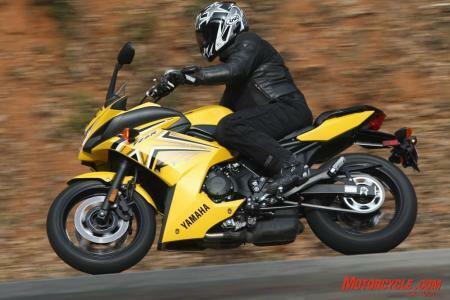 This is where the relaxed riding position of the new FZ6R meets the aggressive style of the YZF-R line. The lower price point and lower saddle heights probably don’t hurt either. The option might appear redundant on the OEM’s part, but it’s providing the buyer a better fit of the rider physique and the pocketbook. These ‘entry sport’ bikes as Yamaha calls them - sub 750cc sportbikes - are at a 5-year sales high with nearly 43,000 units selling in 2008. Yamaha only had an 8% take in that overall market number last year with just one model (the FZ6), and it hopes to make a bigger splash with the addition of the friendlier FZ6R in 2009. If you’re considering the R6 but don’t need the power or want the price, consider taking home the FZ6R. Efficiency runs deeper than just through your wallet. When compared to FZ6, the 6R gets 8% better fuel economy thanks in part to its 4mm smaller throttle bodies and milder state of tune, plus the narrower 160mm rear tire compared to the 180 on the FZ6. A freshly engineered clutch (inner push type versus outer pull) and new crankcase castings are also part of the FZ6R. 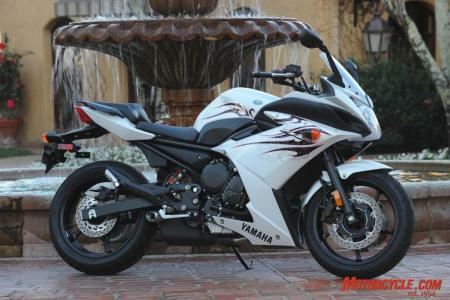 Despite being 8 lbs heavier (11 pounds in Cali), the FZ6R is said to get 43 mpg versus the 40 mpg of the FZ6. The rigidly mounted engine (a stressed member) is hung from a diamond-steel frame and suspended by a non-adjustable 41mm conventional Soqi fork and an easily accessible 7-step preload-adjustable-only Soqi monoshock rear. To keep newbies comfortable and safe, the 6R’s rake is lazy 26.0 degrees, 1.0 shallower than the FZ6, while trail is slightly increased to 104mm. The tubular handlebar is set up to facilitate a tight turning radius. Upon my initial seating, I noticed how easily I could flat-foot with the saddle in its low position. I kept it in its low position and didn’t experience any knee pain after 150 miles. 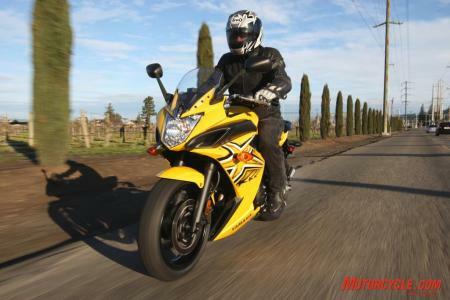 Comparing the FZ6R to the FZ6 (last ridden in 2006), one will notice the lack of punch at the whack of the throttle. The 6R has a milder state of tune, and this pays off with power being available at revs that are more easily accessible – no need to zing it to redline. The engine gains speed slowly but deliberately, accompanied by a slight buzz after 7000 rpm. When it’s time to slow down, the front and rear Brembo master cylinders pipe that stopping power through a 5-way adjustable lever to a pair of dual-piston pin-slide Akebono calipers up front gripping two 298mm rotors. Providing adequate power for the bikes intended audience, they’re not up to the standards of power and feel as racier sportbikes. The rear single-piston pin slide Nissin caliper chomps on a 245mm rotor, the same as found on the FZ6 model. The all-black FZ6R Raven model has an MSRP of just $6,990 while the Team Yamaha Blue/White, Cadmium Yellow and Pearl White paint and graphic schemes run slightly higher at $7,090. Each color has a different graphics package – two are traditional Yamaha and two are more in line with the flashy and cool R6 designs. The FZ6R is a worthy option for someone who wants a practical and easy-to-ride bike yet wants some sporty styling and responses. It’s at your local dealer now.